Do not give the technology people in the business the responsibility for the data, says Martha Bennett, principle analyst serving CIOs at Forrester Research. What organisations need to win in the digital economy, are the capabilities, competencies and culture that close the gap between all the data available, and the ability to run that data into insight. 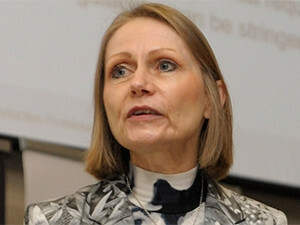 This is according to Martha Bennett, principle analyst serving CIOs at Forrester Research, giving a high-level overview of how to make the most out of the data we have to win in the digital economy, at the ITWeb Business Intelligence Summit 2016 at The Forum in Bryanston this morning. "The world we're in today is one where data is part of everything, including every physical product, because everything, in one way or another, has a data element in it, or is associated with data. And it's not just about data, it's about what you do with the data, the insights, and from those insights, the action taken. "Harnessing the power of data has been the promise of BI all along. But we're a long way away from that, and existing BI systems aren't the answer," she says. "Today there is too often a disjoint between what you ask for from your BI tools, and what you get, or even getting the information when it is too late. Moreover, sometimes it's only when you get the wrong result that you realise how you have to change your query. This results in time loss, as it's an iterative process." What is your customer buying? Businesses need to ask themselves what their customers are really buying. "Everyone talks about what you sell, but what matters is what the customer actually buys. Forgetting that can have nasty consequences." She cites an example of a company whose slogan was 'selling memories'. They forgot what they were selling and went into selling actual camera film. Digital has taken over, and that business is bankrupt. They forgot that customers were buying the ability to preserve memories. "Companies who once sold lifts or elevators, are now selling 'moving people and goods. Companies are no longer selling cars, but the ability to get from 'a' to 'b'. People don't buy health insurance, they buy wellness programmes." Not all data needs to fly first class. However, the question of how to make the most of your data, isn't an easy one, she says. "Even the best struggle. A business manager from a large multinational bank put it best - 'we're drowning in data and starving for insight'. That's why we need a different approach to BI, she says. And there are three crucial elements here. "Firstly, culture. Treat data as an asset, be data driven, and share data across siloes. "Secondly, competence. Have the technical and analytical skills. Have a new approach to data governance, and put agile processes in place. "Finally, capabilities. You need advanced data management, delivery and analysis." She says what also needs to change is the way in which businesses govern data. "It's not about all the data going through a full ETL (extract, transform, load) process. It doesn't need to be that precise. Take marketing for example. They need to know now, which is selling better: yellow or red. They don't need to know the exact number of units, just the trend. This is why it is so important to have the right culture in place, so decisions can be taken based on what we understand from the data." The days of huge projects are over. Delivery of capabilities happens constantly. She also advises not to give the technology people in the business the responsibility for the data. "These people capture, process and store the data in an appropriate manner. The businesses' job is to decide what data is needed, what level of accuracy is required and how long the data should be kept for." In addition, she says not all data should be treated the same, and should be handled according to its importance. There is seldom-used cold data, which needs only a minimal amount of curation at point of ingestion. Then you have warm data, which could be used by some individuals for data discovery and similar. The hot data is where the biggest efforts are concentrated, and where the biggest investments are made. Treat your data accordingly, not all data needs to fly first class as it were." She says this is why we need a new approach to BI architecture. "It is all about componentisation - having different types of data stores, having things as components where you can have different front ends for different types of people. Remember that the more people that have access to data, the more different their requirements will be. There's no single right way to plan." For any BI initiative to work, strive for balance between the tech side and business side. The two sides must come together as soon as possible to get a working system in place, adds Bennett. "Leadership makes a huge difference. Unless there is already a good working relationship between tech and business, good leadership will make all the difference when coming up with a collaborative way of planning and putting things in place. The days of huge projects are over. Delivery of capabilities happens constantly. "You also need a lot of flexibility in what you are putting in place. Make sure application programme interfaces (APIs) are part of your strategy. I would urge against very rigid BI stacks that keep you prisoner in stacks that don't deliver for the business." Also, Bennett says to consider appointing a chief data officer. "But remember CDOs come in many shapes and sizes. Some will be about transformation, others will be analytic or governance focused. Don't appoint one that's like an early chief security officer - a watchdog in place but with his teeth removed. A CDO must have a mandate." Remember agility too, she says, in your systems and processes in order to get the most out of your data. "Bear in mind any digital transformation consists of two strategies, the digital customer experience and digital operational excellence, you need both to succeed. Bennet offers tips to avoid falling into traps. "Firstly, avoid assuming that more data is always better, focus on capturing and analysing the right data. The second trap is not having the skills and expertise needed to work with the unfamiliar, including data sets and or data types, and analytics tools and techniques." Thirdly, she cites the danger of interpreting data out of context. "Remember that scepticism is as important as statistical skills, and without business and domain understanding, you can't tell signal from noise. Everyone talks about what you sell, but what matters is what the customer actually buys. Forgetting that can have nasty consequences. Finally, do not neglect legal constraints. "You need to remember that data may be subject to contractual requirements, and data privacy regulations can be stringent. Security must be baked in from the beginning, not as an afterthought." In conclusion, Bennett says to start by going back to basics. "Always start with a question that is linked to a business objective or known issue. Create an environment that supports collaboration, agility and a short time to value." Once you've got your insight or insights, be prepared to do what's needed. "Take action. Think what it is going to take to really turn the insight into action - if you're not willing to follow through, don't do the project."